I watched The Lady Vanishes on Netflix Canada. I cannot guarantee its availability on Netflix anywhere else. 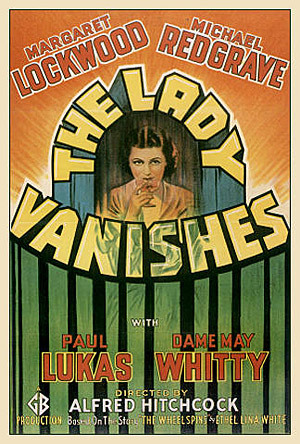 The Lady Vanishes (Director: Alfred Hitchcock): For at least the first twenty minutes or so, I was almost certain that I was watching the wrong film. Far from being the chilly Hitchcock thriller I was expecting, this seemed almost like a slapstick comedy of manners closer to Lubitsch or Preston Sturges. The action begins at an overcrowded inn in a snowed-in mountain village in a small fictional European country. As the guests wait for the following day’s train, we have time to observe them each at length. There are the two upper-class English twits, desperate to get back to Blighty so they can catch the last stages of an important cricket match, and the group of young English lovelies, one of whom is returning to London to get married, somewhat reluctantly. There’s an older governess, also English, returning home after several years living in this small country. And a couple carrying on an affair, eager not to be discovered by their fellow travellers. Then, most dramatically of all, we meet a rather obnoxious young Englishman who claims to be a musician but who seems to be the late 1930s equivalent of a rich hippie. I’d have happily watched a film of all these characters simply passing the time in the hotel. There’s some great business with the cricket fans taking the room of the maid, who keeps coming in to retrieve her things. They’re not quite sure if she’s flirting with them or offering some sort of “room service.” And when young fiancée Iris and musician/hippie Gilbert meet cute, we know the sparks will continue to fly, to the detriment of Iris’ unseen beau waiting at home. But once they do all get on the train, the mystery begins almost immediately. After Iris is hit on the head by a falling package at the station, the kindly governess Miss Froy helps her onto the train and offers to sit with her to make sure she’s alright. After a cup of tea together in the dining car, they return to their compartment where Iris falls asleep. Upon awakening a short time later, Miss Froy has vanished, and nobody else on the train claims to have seen her at all. I enjoyed the first hour much more than the last act, which devolves into clumsy war metaphors and drags on far too long. But the performances of Margaret Lockwood (Iris) and Michael Redgrave (Gilbert), as well as of Dame May Whitty (Miss Froy) kept the whole thing quite jovial throughout. And even though Hitchcock does show “foreigners” as generally suspicious, he tends to portray his countrymen as either pompous fools or stubbornly naive. Although The Lady Vanishes was remade in 1979, I can’t imagine it would be half as interesting without the actual anxiety bubbling throughout Europe in those days, at the very edge of a war that would consume the entire continent within the next year. This entry was posted in Netflix and tagged 1938, hitchcock, trains. Bookmark the permalink.